By his cat shall ye know him. 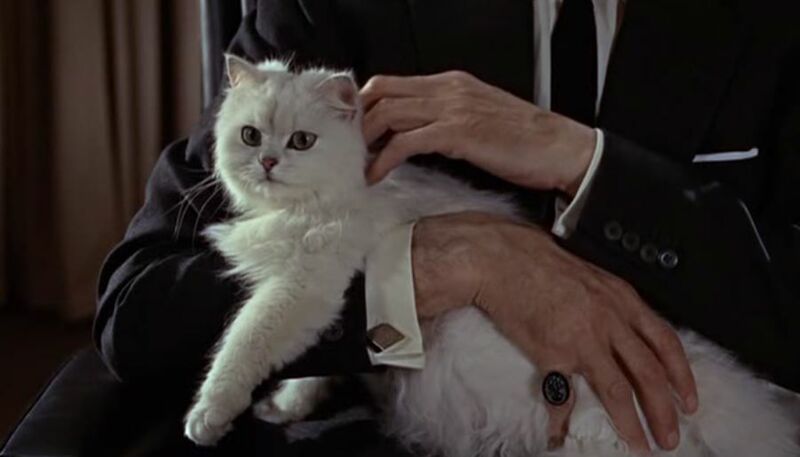 The White Cat of Evil makes its first of many appearances in the arms of James Bond’s nemesis, Ernst Stavro Blofeld – leader of SPECTRE (Special Executive for Counter-intelligience, Terrorism, Revenge and Extortion), evil mastermind and all-purpose supervillain. In From Russia With Love Blofeld’s arms and torso are played by Eric Pohlmann (voice) and Anthony Dawson (arms and torso), but he’s so evil we don’t see his face till three Bond films later, in You Only Live Twice (1967), in which he’s played by Donald Pleasence. Meanwhile, the White Cat of Evil takes centre-stage. This entry was posted in White Cat, White Cat of Evil and tagged From Russia with Love. Bookmark the permalink.